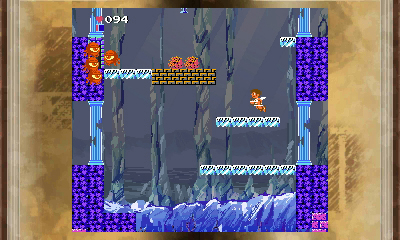 A 3D remake of the NES game Kid Icarus, developed by Arika for the Nintendo 3DS. Pit, the head of Palutena's angel guard, must quest through the Underworld, Overworld and Skyworld in search of the Three Sacred Treasures in order to bring down the Goddess of the Underworld, Medusa. The gameplay is the same as the original, but new background designs have been added and it's clear which platforms are solid and which can be passed through. You can also slow Pit's descent by tapping the jump button to flap his wings, making the tricky platforming sections easier.